Tell…your children of it, and let your children tell their children, and their children another generation. 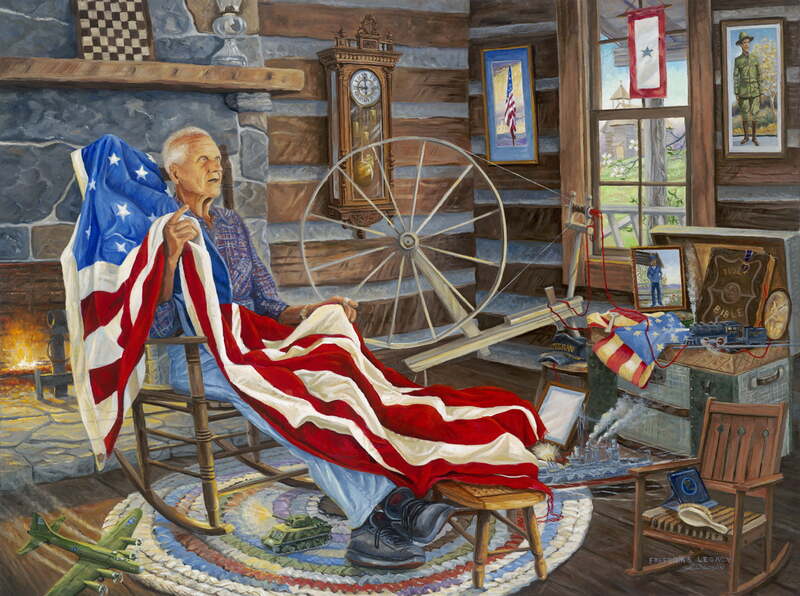 The aged veteran sits in an old log cabin, sharing stories of the sacrifice required for our freedom. Observe his careful handling of the flag draped across his heart and lap, never touching the floor. The little rocker in front of him is where a child sat, learning just one more story of endurance, truth and service. The electronic tablet in the child’s chair evokes the changing generations. The chest by the window holds treasures that admonish us to cherish our legacy and make a lasting impact for good in the world. The plane, tank, battleship and train appear to be in battle, suggesting a living story. The antique clock on the wall registers 9:00; the hour of the greatest battle ever fought when Jesus hung on the cross for our sins, securing our greatest freedom through His sacrifice. An heirloom spinning wheel pulls a crimson thread from the old Family Bible in the chest through the flag and into the hand-woven rug, symbolizing His message of redemption to the world. The empty frame beside the trunk is for your story; the treasured memories you hold in your heart. May we always take the time to teach, honor and live freedom’s legacy.